It was 1961, I was almost 10 years old and for months I had ridden my bike past the "Handy Shop" in Rumford, RI, USA, near where I grew up (shop is still there in 2015...only now it's a Bakery!). For my soon to be birthday I wanted this "thing" in the shop window so bad I could picture it on the nitestand beside my bed ! 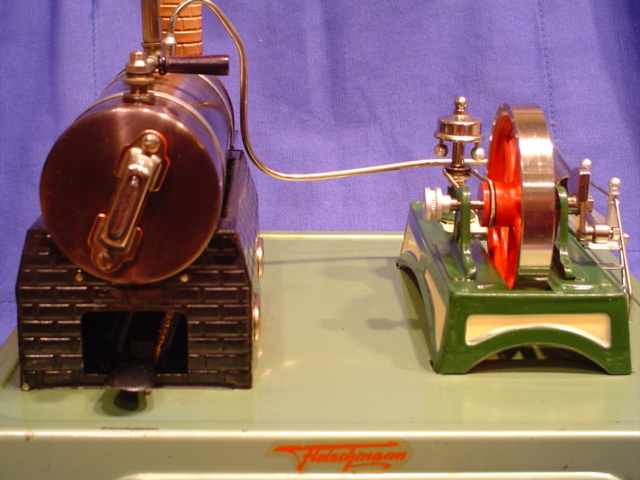 That "thing" turned out to be a German made Fleischmann stationary steam engine and for my 10th birthday it became mine, what a lucky boy I was. NO other kid I knew had such a thing and this was custom made for show and tell day at school. Can you imagine the euphoria of a 10 year old given permission to light a fire and send hot spits of steam all about the classroom? It just didn't get any better for this boy. Little did I know then that more than 50 years later I would still have my Fleischmann, it's box and funnel included, and a "few" more of these strange and wonderful contraptions will have found their way home with me since. But what happened in the interim?? I grew up the rest of the way I suppose, met the lady of my life, married, worked, raised 3 kids and retired in 2004. On Thanksgiving weekend in Nov. 2002, I was in the basement and spotted my old Fleischmann up on a shelf. I couldn't remember when I had run it last, so with a bit of time on my hands I got it down for a family "show and tell". The engine was soon fired up again, but I got a rude surprise and a flashback of why it hadn't been touched in years. It must have gotten bumped in one of many household moves, such that the steamline was slightly detached from the point where it entered the oscillator. Steam spewed in such a fury I yanked the fuel tray out and threw a towel over it...so much for show and tell round one. When it cooled down I stared at a botched soldering job done by a much younger me trying to mend nickel-ed brass pipe work with a wood burning tool or something just as crude...it was blobbed with solder hanging on by force of habit alone. But, now I was a bonafide adult and I could wield a torch and plumbers solder with finesse. 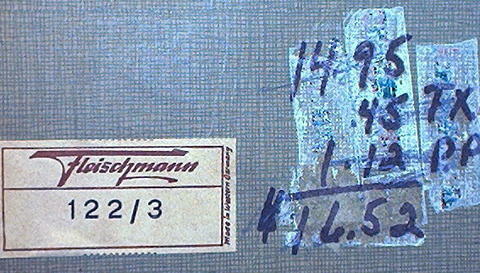 It took some time, but I soon had the Fleischmann repaired properly and it was singing along like that birthday in 1961. I likewise stunk up the house with what little Esbit was still in the box, irritated my young adult kids and dogs by tooting the whistle countless times and watched my lovely wife shake her head and figure I was regressing into childhood, which I was. For those trying to confirm model and date of manufacture for a Fleischmann they own, I found a neat German Website that you can stumble around on...all in German, but you can figure out models and dates easily enough. For a touching history of Fleischmann and their link to Doll of Nuremburg, read this article by a relative of the original Doll co. founders: Fleischmann - Doll history . I'm thankful to have this Fleischmann and a Bing engine that have roots back to the worldwide epicenter of toy manufacture. It's Feb. 2015 as of this edit of my website...Does my 58 year old Fleischmann 122/3 still run today??? You bet!!! Well...it took about 48 years, but in Oct. 2009 I purchased my first Fleischmann accessory to accompany my childhood Fleischmann engine seen above. 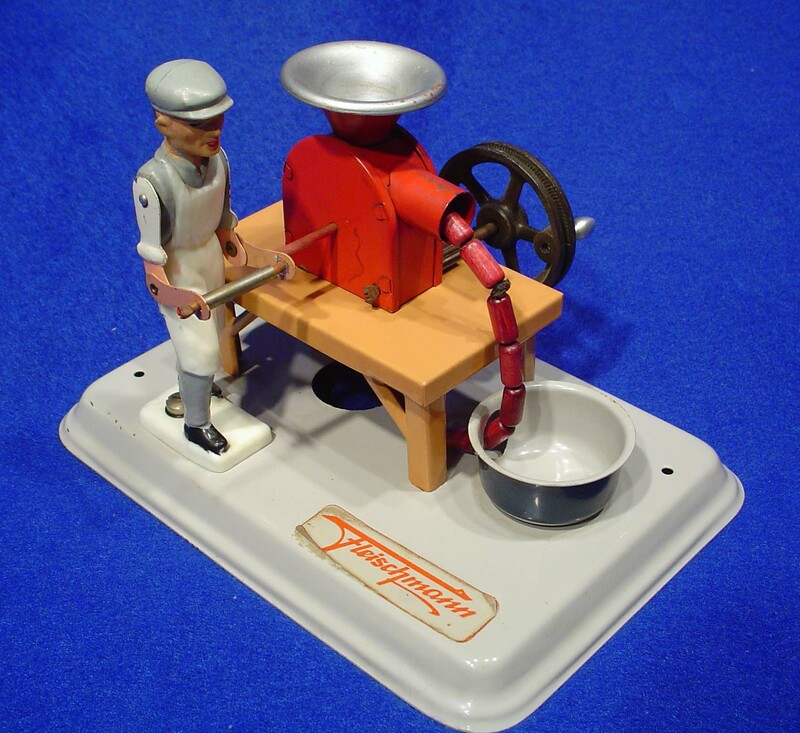 This one is a favorite of young and old...the Wurstmaschine or Sausagemaker #236 of 1963 vintage. Turn the crank by hand or let the engine do it and the man gets animated while sausages flow in a continous stream into the tub beneath his grinder. I will have to lash this little fellow up to the 122/3 and have him make me a few sausages on video. A very cute accessory! I then discovered there were more out there ! Following that Nov. 2002 holiday, I quietly began searching on this thing called eBay which was relatively new to me. I was looking to see if there were more of these little engines out there for grown up boys. 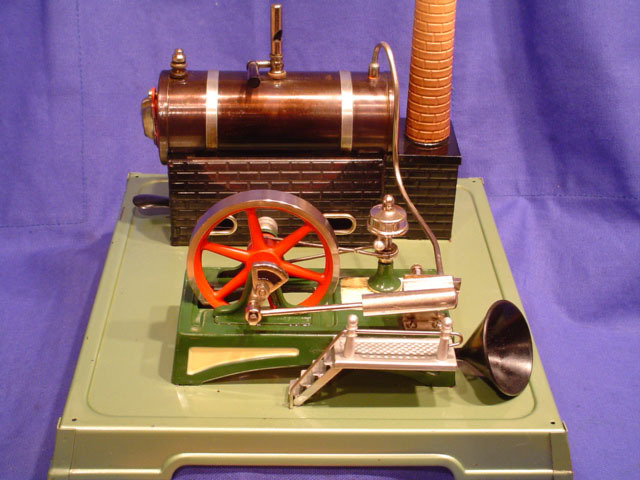 There were plenty to choose from, but I searched several months to buy my second toy steam engine, a well made piece from Jensen Steam Engines of Pennsylvania...a company still in business after 85 + years as of this writing in Dec. 2018. A check of the Jensen Steam Engine tab to the left, once showed that this initial Jensen purchase spawned more...I had a dozen or more at one point but in the fall of 2018 I sold off all Jensen engines except for my beloved Jensen 51 replica described to a great extent in other tabs. Once I got that "fixer upper" Jensen looking good and running well, I had the bug, the rest has been a wonderful journey of discovery, learning what I like and don't like in toy steam engines, learning how to restore them properly without butchering a piece and basically finding a marvelous hobby to pursue in my retirement. My philosophy in all this? ALL engines in my collection eventually get run, then run regularly...they were made to be toys and meant to be enjoyed. I usually take an incoming "rough" looking engine and strip it down to bare metal and wood from top to bottom and restore it to "like new" appearance and functionality. It's just the way I like them...they might be an investment to the next person, but to me they are toys to be enjoyed and protected first and foremost. I have never lost money on the resale of one of my restorations, so I take with a grain of salt the adage that to restore destroys value...it hasn't for me. One must use discretion and some pieces are best left alone, but a well done restoration is always worth more than a pile of rust! As of this writing (Dec. 2018)...I have a total of 33 operational steam engines, stirling engines and steam turbines. I've had as many as 60, but as my interests matured a bit, I sold off some of the lesser pieces and have focused more on quality, machinist built engines..."less is truly more". In 2010 I also redirected some funds from steam into electric trains to rekindle my early love of 1950's Lionel electrics. By 2013 I was venturing into old clocks and watches. Nothing more sure than change in collecting tastes and preferences. All these mechanical joys now happily co-mingle in my shop! Why did I make this website ? For me this is an online place to organize and showcase my collection, share tips and tricks learned in the restoration of these little engines, enjoy the challenge of making this darn website stuff work and lastly a means to communicate to and fro with fellow toy steam collectors. My hope is this website will inspire more folks interested in toy steam to jump in and try it out. There are engines to meet all price ranges and more than half the fun for me has been resurrecting the most decrepit ones rescued from eBay. This website was launched in June, 2006. I heartily recommend making a website of your own collection if the spirit moves you...it only cost me about $5 USD/month and I personally enjoy it like a scrapbook of my collection and restoration efforts. 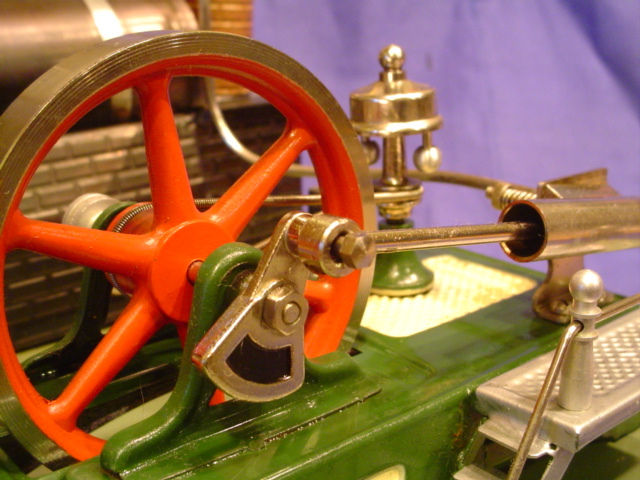 Website has expanded as of Dec. 2018 to include other collectibles like electric trains, windup clocks/wristwatches and model cannons/mortars...diversity indeed, but all enjoyable to me. I've included more than 70 video clips with sound of engines under steam power as of Feb. 2015 and they can be accessed almost instantly by built in YouTube links. Have a look, especially if you are shopping for an engine and want an idea of how it runs and sounds. I haven't filmed all my engines yet, but I plan to as time permits. So check back once in awhile if you are curious. Though I have sold off an number of those engines featured in films...I will leave the films in place for educational/identification purposes at least. Check out a new (2019) steam forum based out of the U.S. but with plenty of O.U.S. members. www.officeofsteamforum.com Our hobby is an obscure one and sometimes one feels there are simply no others around with like interests. The internet has bridged the gap. And what's with the name IndianaRog ? 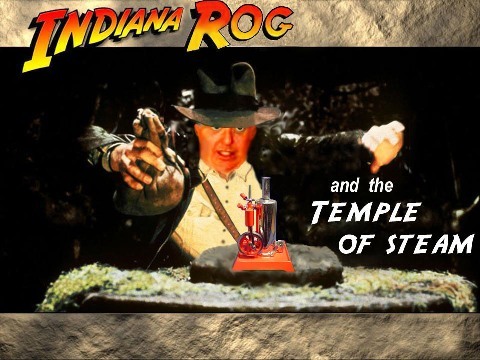 Well, it seemed like a natural for use on eBay and other online endeavors since I do live in Indiana, the name is Rog and I have a great fondness for Indiana Jones movies. 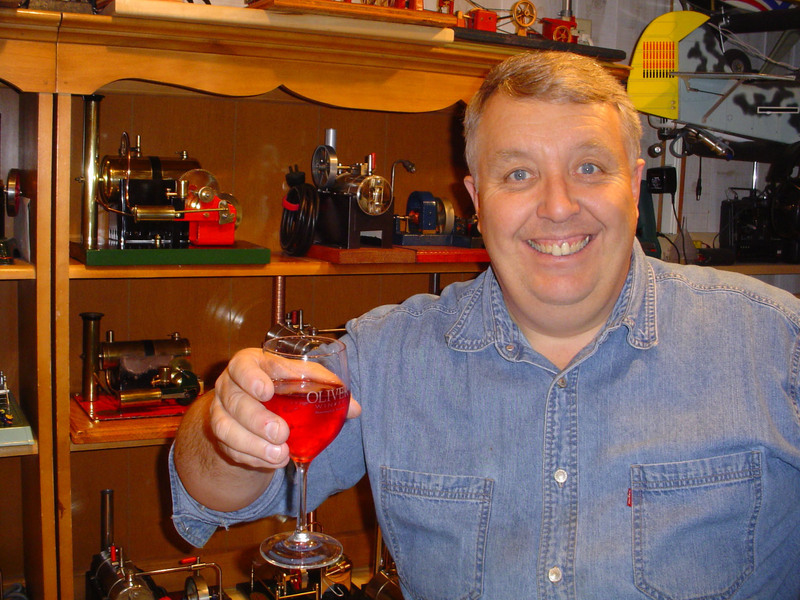 Oh well, I can dream...meanwhile here's me cheering you for joining the world of toy steam collectors, from the Temple of Steam that is my basement workshop. Unfortunately, spammers have latched onto and clogged my former Guestbook causing me to have to deactivate it. I have also temporarily deleted an email address I had posted here because the spammers are on to me big time sending ME spam from my own account no less. If I find a way to let you ask questions or make comments in the future, I will post here...til then I regret I am not accessible as of Sept. 1, 2013.